Heat oven to 325°F. In large bowl, beat granulated sugar, shortening, butter, lemon peel and egg with electric mixer on medium speed, or mix with spoon. Stir in flour, baking powder and salt. On lightly floured surface, roll half of dough at a time 1/4 inch thick. 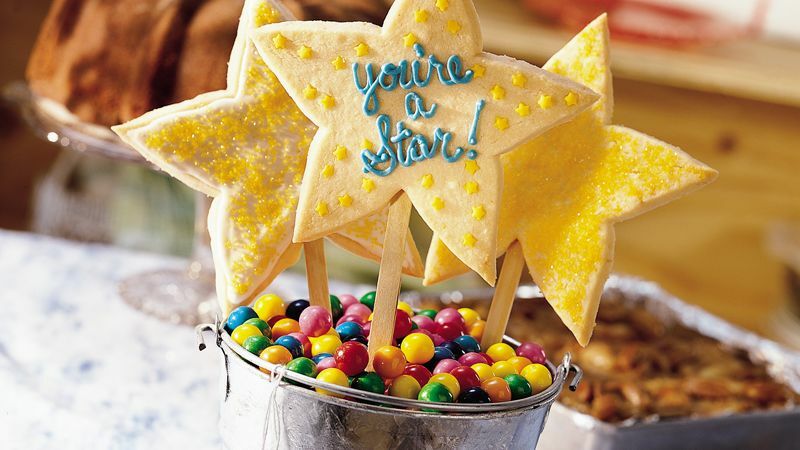 Cut with 6- to 8-inch star-shaped cookie cutter (or make your own 6- to 8-inch cardboard star pattern, place on dough and cut around pattern with small sharp knife). On ungreased cookie sheet, place cutouts 2 inches apart. Carefully insert 1 inch of craft stick into side of each cookie. Bake 15 to 18 minutes or until light brown. Cool slightly; carefully remove from cookie sheet to cooling rack. Cool completely, about 30 minutes. In small bowl, mix all glaze ingredients until smooth and thin enough to drizzle. Spread glaze over cookies. Decorate as desired with icing and candies. Fill a clean bucket with candies to create a fun holder for the cookie pops.